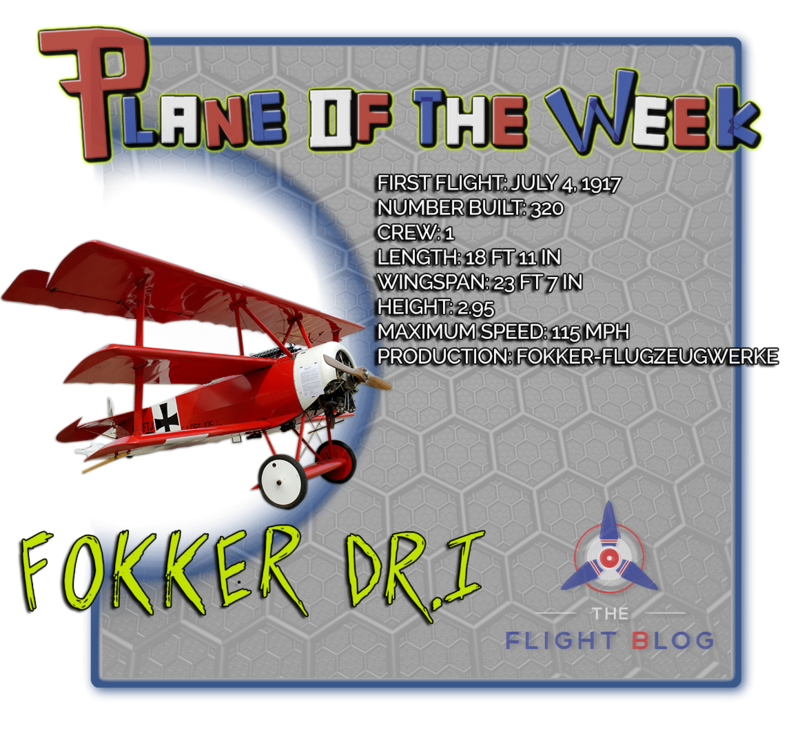 The Fokker Dr.I triplane was introduced in 1917 by Dutch aircraft manufacturer, Fokker-Flugzeugwerke. The WWI fighter aircraft saw widespread service in the spring of 1918. The Fokker Dr.I became famous through Manfred Albrecht Freiherr von Richthofen (the Red Baron), who used it during his last 19 victories. It was also the aircraft in which he was killed on April 21, 1918. When the British Sopwith Triplane began to appear over the Western Front, it quickly proved its superiority to Armed Albatros fighters used by the Luftstreitkräfte (German Air Force). Dutch aviation pioneer and aircraft manufacturer Anthony Fokker instructed German aircraft designer and manufacturer Reinhold Platz to build a Triplane. Though Fokker viewed a captured Sopwith Triplane, he didn't give Platz any information regarding its design. Platz designed a small, rotary-powered triplane with a steel tube fuselage and thick cantilever wings (V.4), but its unbalanced ailerons and elevators resulted in too-high control forces. Fokker revised the prototype and designated it V.5. The Idflieg ("Inspectorate of Flying Troops") ordered 20 pre-production aircraft. The first two pre-production planes were designated F.I (serials 102/17 and 103/17, respectively), while the remaining pre-production aircraft were designated Dr.I. Idflieg ordered 100 aircraft in September and 200 in November. The Dr.I was exceptionally maneuverable, especially compared to planes like the Albatros. Rudder and elevator controls were light and powerful, though the ailerons were not very effective. Rapid turns were facilitated by the triplane's marked directional instability. Although it was very maneuverable, it was markedly slower than contemporary Allied fighters in level fight and dive. Despite its excellent initial rate of climb, performance at high altitudes dramtically fell due to the low compression of the Oberursel UR.II engine. Other aircraft deficiencies include poor pilot view during takeoff and landing; a cramped cockpit with inferior-quality materials; and both the proximity of gun butts to cockpit and inadequate crash padding left the pilot vulnerable to head injury in the event of a crash. In November 1917, Idflieg grounded the triplanes pending an inquiry on wing construction after a couple planes broke up in flight. A Sturzkommission (crash commission) concluded that poor construction and lack of waterproofing allowed moisture to damage the wing structure, causing the wing ribs to disintegrate and the ailerons to break away in flight. Fokker improved quality control on the production line and strengthened the rib structures and the attachment of the auxiliary spars to the ribs. Existing aircraft were modified. Idflieg authorized return to service on November 28, 1917. However, the Fokker DR.I aircraft continued to suffer from wing failures. Production ended in May 1918, with only 320 aircraft produced. The Fokker D.VII entered widespread service in June and July and ultimately replaced the Dr.I on the front lines. Manfred Albrecht Freiherr von Richthofen (2 May 1892 - 21 April 1918) was a German fighter pilot with the Luftstreitkräfte. Considered the "ace-of-aces" of WWI, he has been officially credited with 80 air combat victories. Transferring from the cavalry to the Air Service in 1915, he quickly distinguished himself as an accomplished fighter pilot; in 1917 he became leader of Jasta 11 and then the larger unit, Jagdgeschwader 1 (known as the "Flying Circus"). While the Red Baron is frequently most associated with his last aircraft, the Fokker Dr.I, his first aircraft was a two-seater Albatros C.III. Richthofen also flew an Albatross D.II, an Albatros D.III, and an Albatross D.V. Only 19 of his 80 kills were made in the Dr.I. It was also the Albatros D.III aircraft (Serial No. 789/16) that he first painted red in January 1917, and in which he first gained notoriety. Though he championed the development of the Fokker D.VII, he never had the opportunity to fly it.